I wish I could put a scratch and sniff sticker on my blog. Words don’t do justice to the wonderful scents that tickled me awake on Friday. Truth be told – it wasn’t breakfast. It was lunch. And yes, I slept until 12:00. But here that’s normal – at least during the summer if you’re on break from school (which they are). I arrived in Chile on Wednesday and it’s been phenomenal so far. I feel rejuvenated and alive! For those who don’t know, I lived here during college for 7 months and am staying with the family that hosted me then. I have a mother, Maritza, and two sisters – Karen (26) and Meli (20). They are truly like family to me. 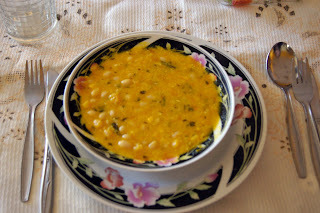 We've also had porotos granados. The translation is a little rough (and my Spanish is a little rough) so it's basically like a bean stew. 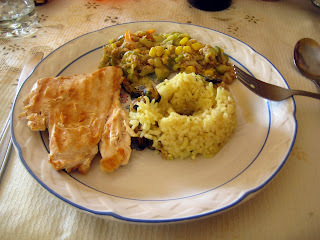 It's a very traditional Chilean dish that takes hours to make. I was, to say the least, grateful. Yesterday's almuerzo was a story in and of itself. When somebody tells me we're going to eat it's like Pavlov ringing the bell. We went to a restaurant on the beach and waited for TWO AND A HALF HOURS before finally getting seated. In the "world of Annie," waiting for two and a half hours to eat is like death. Death to Annie. I resorted to munching on cereal while I waited and was near panic when we finally got seated. 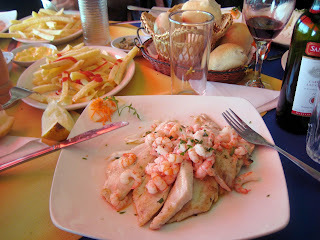 The meal, however, was delicious...reineta con camaron (white fish topped with shrimp) and of course - some fried potatoes and bread on the side. Carb up. 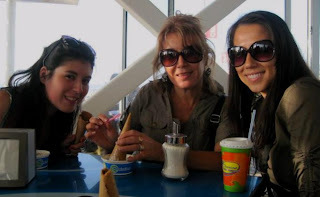 In Chile food is a means to enjoy your relationships. So today I caught up with an old friend over sushi for lunch (while talking) and then we walked along the beach (talking), stopped for coffee (talking) and sat on a park bench (talking) for about 5 hours. I love how conversations flow so naturally here, how people are so honest in their friendships, and how talking is a pleasure and not an obligation. What we realized is that he and I may live worlds apart but we still have the same issues - finding the right career, building a successful future, falling in and out of love, and deciding on a path that truly makes us happy. Somehow I find that very comforting. And thus, I leave you with this thought...it's a small, small world. Whatever problem you're currently facing, you're not alone. Someone, somewhere out there is experiencing the same thing right now. Somebody is having the same feelings, the same doubts, the same wishes and the same dreams. And hopefully that distant sympathy brings you some comfort as well. Yes, that is me at the Toronto Pearson Airport noshing on white cheddar popcorn. And since I’ve only slept for 2 hours in the last 36 I’m not certain if it’s the popcorn or something else that’s making me so sublimely happy (sarcasm…well, kind of). After last minute details, goodbyes and packing I’m finally on the road! I have to give a special shout out to my parents for putting up with me packing all night long even though they were attempting to sleep. And Dad was gracious and patient enough this morning to wait in the car as I ran back into the house at 6:02 AM (17 minutes late to be exact) because I left my iPhone (a.k.a. lifeline) charging on the dock. Thank you Mom and Dad! Since I’m notorious for my short temper and little patience, my mom gave me some parting advice. In 2007 we travelled to Mombasa, Kenya. Our flight from London was late and we missed our connecting flight to Mombasa so we were stranded with only 3 other flyers in the entire Nairobi airport. I, to say the least, was not pleased – and I let it be known. I just perpetuated the stereotype of Ugly Americans (sorry guys, next time I’ll wear my Canadian flag hat, eh?). In the midst of my rage, my mom, always a social butterfly, struck up a conversation with one of the other stranded ladies. To this day she has kept in touch with Sarra from Tunisia, who was there on business. And she will be visiting Sarra this fall. 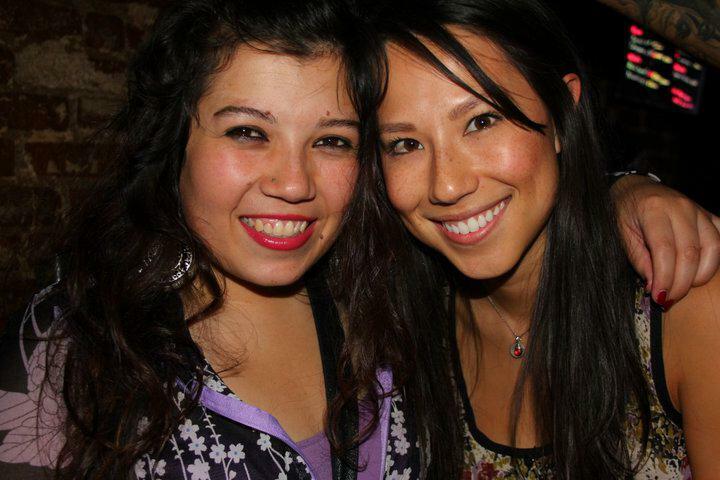 Additionally, once Sarra found out about my trip she extended an invitation to me as well. Sooooo….I might be going to Tunisia, folks. Mom was reinforcing that everything happens for a reason and it’s not always apparent right away. So she encouraged me to have an open mind since “bad things” will inevitably occur on this trip. I need to “make lemonade.” I’m making a promise to be present and enjoy my experiences for what they are. Heeding her advice, when I landed in Toronto for my 8 hour layover, I moseyed into town. The only recommendation I got for a tourist destination was the mall (wow, they pegged me fast) and I wasn’t thrilled about spending all that time at a mall since my credit cards have already taken a beating and my luggage zippers look like they’re gasping for air. But I ended up meeting 4 people – all very helpful and all very uplifting. What better way to spend my layover than dinner chatting with the waiter and bartender, and an empty shuttle express ride back to the airport with an interesting driver? All topped off with a bag of popcorn (even better - white cheddar). So tonight as I board “Segment 2” I leave you with this thought...when something “bad” happens to you, can you pause to see the good in the situation? Ask why this is happening right now. And be present. Once that moment passes, you will never get it back – whether you want it or not. It's been a long 5 days waiting to get confirmation on my Round the World (RTW) ticket, but it is finally done! I just made the biggest (gulp) purchase of my life. Even though I've memorized my credit card number...thanks to Groupon...I know when the lady at Continental asked me for it my voice shook. I mean, for a girl whose "Green Monster" vehicle as my dad calls it, cost me $750, shelling out about 10 times that was slightly unnerving. But, as a wise friend once asked me, "What's your life worth?" And that's truly what this ticket is to me - my life. I'm making my dreams a reality. This is "one small step for Annie (checking off my pre-departure list), and one giant leap into reality (I'm actually doing this)." Sometimes big risks = big rewards. So I took a leap of faith and quit my job, moved back to my parents’ house, and used my savings which was going towards a condo to buy a BIG ticket instead. 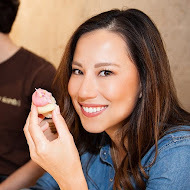 Over the next 5ish months I'll be stopping in Chile, Argentina, South Africa, Greece, Israel, Vietnam, Singapore, and China to experience a locals' perspective by learning how to cook and eat with host families. As somebody whose best culinary specialty is a grilled cheese sandwich (I'm proud to say my brother claims I make the best) my attempts at authentic cuisine should be entertaining. Beyond the food and recipes I will share with you, I hope you find energy and inspiration from my experiences. Thank you for joining me on this journey! And since I’m reflecting on my dreams and realities, I'll leave you with this thought...what is your dream? And what is it worth?